Motion sickness caught me on my last flight, although it has never been an issue to me before. The turbulent air over Denver, the hothouse effect under the goggles and my brain trying to make sense of the pitching and yawing moments of the aeroplane – it was too much. It happens fast but takes long to disappear again. I learnt a real lesson yesterday. Isn’t it interesting that the gut feeling before flying often predicts a hairy flight? I didn’t have enough sleep and had to get up two hours earlier than usual. I worried about the drive down to Denver. We had a snow storm that brought another 12 inch onto the snowpacked roads. Down in Denver I had an appointment to install new winter tires, since the old ones struggled in Winter Park’s conditions. 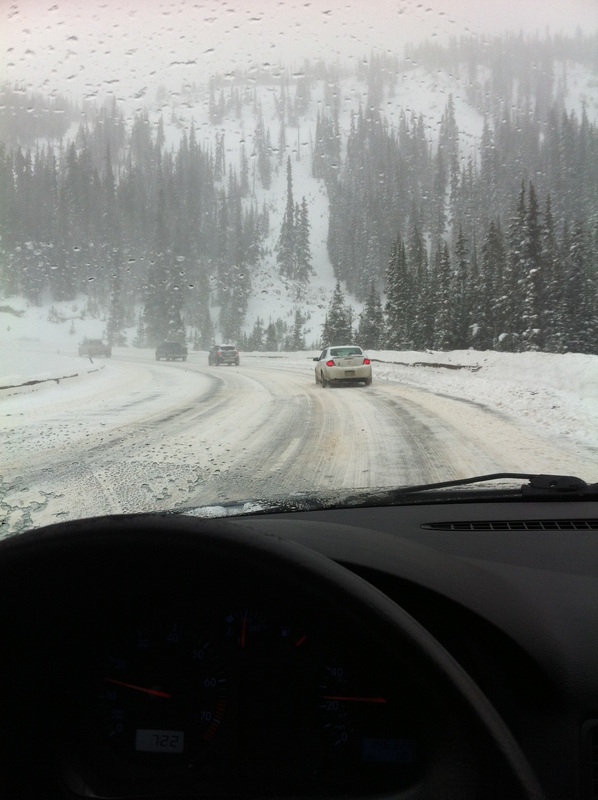 At around 7 o’clock the traffic stopped uphill on Berthoud Pass. Every five minutes or so I heard them blast avalanches. The snow went over the road so they had to blow 6 feet of snow before the traffic could get through. Anyways, after having installed the winter tyres I finally arrived at the flight school. I was way too tired to fly, but hey: I had a flight instructor with me, I practiced many approaches in the MS Flight Sim the day before. What could possibly go wrong? 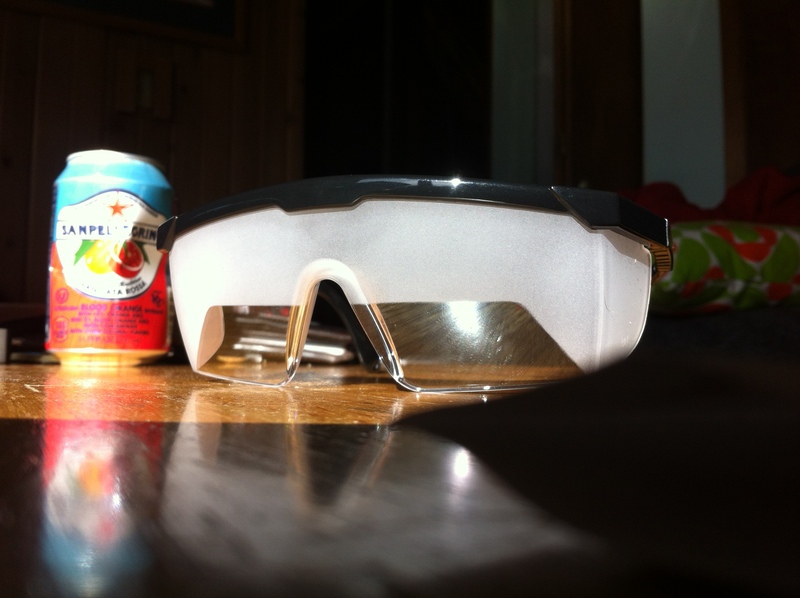 Goggles for simulated instrument flight. We took off from runway 10 at Centennial KAPA, and right after takeoff Joshua took over the plane. I put on my IFR goggles so I couldn’t see outside. The turbulence was bad, the only time I had worse wind shear was when I flew to Neuchâtel once. The airplane banked sometimes abruptly and I was too busy to pay enough attention to keep the inclinometer’s ball centered. When flying VFR I am not looking at the instrument but at a point straight ahead of the airplane and my feet move automatically by information from outside the window. By definition the turbulence was probably light. Severe or extreme turbulence, in which control of the aircraft is momentarily lost), aren’t reported very often. I remember a PIREP from the instrument ground school of a Boeing airliner that read something like /RMK LOST CONTROL OF AIRCRAFT. In respect thereof it wasn’t that bad. I started to feel funny, though. I was sweating cold under the goggles and I felt dizzy. Five minutes after takeoff I asked for a bottle of water – and Joshua realized there was something wrong. We didn’t have anything with us so he opened all air vents. “We can immediately turn around if you want.”, suggested my instructor. I didn’t drive three hours down to Denver just to turn around, so my macho won over my rationality and I answered that I was fine. Joshua took over the radio until I was handling it again. 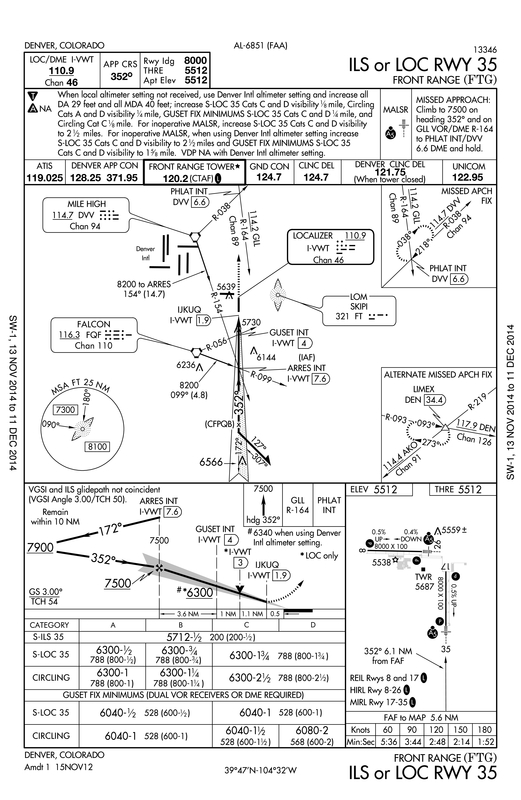 I briefed the ILS RWY 35 approach into Front range and received vectors to final from ATC. It seemed the class Bravo controllers of Denver didn’t care that there was a small Cessna buzzing around. ILS or LOC RWY 35 into Front Range, Colorado. Due to the turbulence the directional gyro was preceding a lot and I had to check the magnetic heading every few minutes. I was able to intercept the localizer and after some time the glideslope became alive. I found it a lot easier than in the Redbird FMX simulator but thanks to my airsickness I couldn’t concentrate on anything but the CDI and glideslope. I forgot to time, I had trouble reading the altimeter (which seriously shouldn’t be a difficult task) but at least the radio communication went surprisingly well. RNAV (GPS) RWY 35 into Front Range, Colorado. 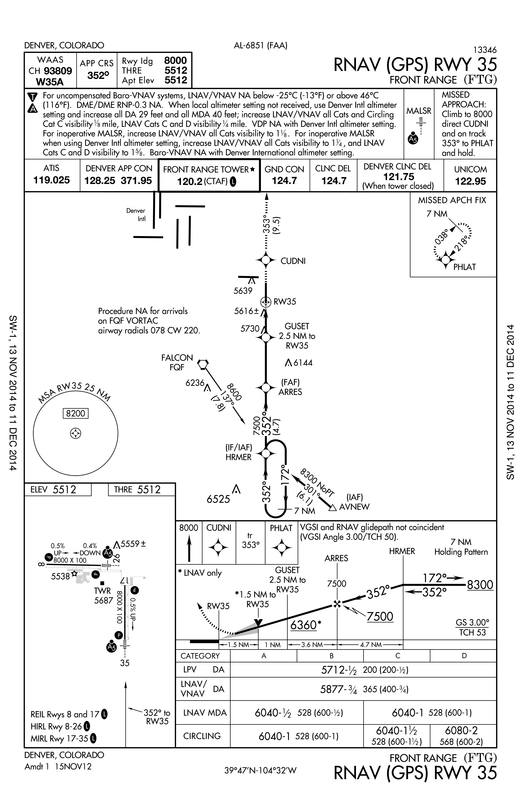 The GPS approach felt pretty much the same as the ILS approach. I was trusting GPSs more and more after flying with my iPad and Foreflight. Unluckily, about 300 feet above the ground, 100 feet above decision altitude the Garmin 650 read “NO SIGNAL” and I had to fly the published missed approach. Somehow I don’t hesitate to trust in NDBs that work with as little electricity as a lightbulb compared to this fancy satellite system. I did the flight back VFR and tried to relax but I was still airsick and knew I needed to get on the ground to feel better. After parking the plane I stayed in the lobby for an hour or so, I had enough of moving vehicles for a while. After what I thought was wasted time, we did a de-briefing and I realized that I could learn a lot from this experience. Josh pointed out that it could be that there is only a thin cloud layer and blue skies above. But if it was turbulent it might still become a dangerous scenario. On the drive back home I was able to handle the two dimensions involved, without my feeling getting worse. After two hours of driving, I finally found myself at home on the couch and I chose the horizontal as my only dimension for the rest of the day. Thanks for sharing your experiences! As a budding student pilot, it was useful to read about difficulties you had in interacting with the flight instruments (like the altimeter) while experiencing air sickness. In my current line of work as a graduate student, I’m frequently guilty of going to work sleep deprived, and I have to be really tough on myself to actually get enough sleep before my flights. Thanks for the reminder that sleep deprivation and stress can contribute to more trouble down the road. thanks for your comment. It can happen to others but not to us, right? That is exactly the macho attitude every student hears about during the PPL class. Reading an altimeter wrong is scary to say the least.